It’s time for a political rant again. Today I went to my bank because I saved money and since it’s easier to count 100 Euro notes, I wanted to exchange my remaining 50 Euro notes. 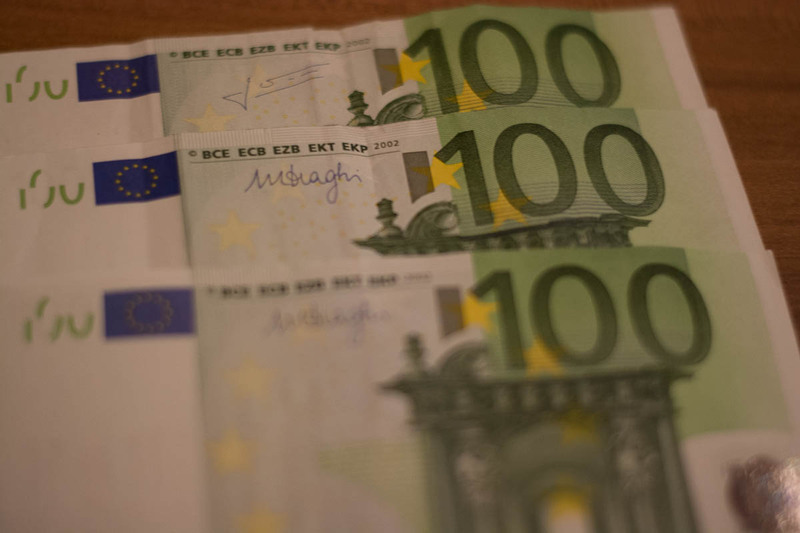 The idea did sound easy, just go to the bank with 300 Euro in 50 Euro notes, and ask them to give me 3 green 100 Euro notes. The woman behind the bar then asked me for my credit card and I told her that I just would want to exchange the notes to larger ones, I didn’t plan to put this on my account. Then she added that she would also need my identity card. I asked her why, and she told me that this is the new anti terror law and anti money laundering legislation. What followed was a waiting time of 10 minutes since she did document all of my information’s with the computer. When she was done, she was a bit loud and said “Here are your green 300 Euro”, which made it worse because the person behind me had this stupid face as if he thought “What the actual fu… 10 minutes for 300?”. Now let me get a bit political. And for your information, if you’re new to my blog and if you start gasping whenever you read an opinion more leaned to the right, you better leave the blog right now to stay healthy, because I usually don’t beat around the bush. But if you can take it, read on. The first counter argument to my opinion will probably be that I don’t have to fear anything if I am not a terrorist, and this is true. I don’t fear anything if they get my information’s because I am not a criminal of any kind and the money was of course clean. However, there was a time where we didn’t need surveillance laws like this one, it was possible to walk straight in and out of the bank with exchanged money. How could it happen that we do now have these laws in Germany, and probably also in other countries? I can just talk for Germany and I will do this now. The answer to this question is very easy. Our political elite had the glorious idea to flood our country with criminals. The flood gate was opened on a way without monitoring first what kind of water would come through. They didn’t check if the water would be clean or dirty. Unfortunately the water was partly also very dirty. We basically did import drug dealers, rapists, stabber, sexual offenders and all kind of criminals, and last but not least we also imported terrorists. There is visibly more crime on the streets now, and terroristic news become more regular as well, like delusional and religious fanatics stabbing people because they think this is the ticket to the paradise. But criminals or terrorists are not the enemies of the state as it seems, the enemies are people like me, my grandmother, my friends or whoever lives in Germany. The ruling parties would rather use terroristic acts to put more surveillance on us citizens than to admit their own mistakes. The single biggest mistake was to help such masses of refugees. If there is surveillance needed, then right before someone gets permit of residence in Germany. This person wants something, and to achieve this, all cards have to be put on the table without excuses. As German citizens, I want it, my family wants it and all my friends want that our government doesn’t import trash. As people living here, we have a right to demand our government makes sure that peaceful people immigrate, not hateful or criminal ones. And the people I know demand something else too, in my circles we basically demand that our government starts to think about the numbers. No, inviting a million people is not what we want. To be honest, we don’t want that our indentity gets killed by mass migration. The truth is we can’t help anybody, and we absolutely shouldn’t. Even if our elite is preaching the opposite, I couldn’t care less. I hate it, and I absolutely don’t want it. It’s not only that some of the districts in our city look like rat holes now and start to lose identity, now we do even have to tolerate total monitoring because some lunatic Islamists do hunt and kill peaceful people in our streets. This is caused by welcoming everyone and everybody. Accepting refugees is not really the problem, but accepting such large numbers of refugees without questions is. I myself and most people I know hope for a system change, and if the day comes, I hope the today responsible politicians will get jail time for what they did with our country. These people are not against terrorists, they are against us citizens and I hope one day they will pay for it. For now we just have to accept that our country becomes a surveillance state, it’s their way to fight what they caused.